When Mike London served as a police officer in Richmond in the 1980s, he had a weapon aimed at him and the trigger pulled. The gun kicked, but the bullet failed to reach its target; an internal malfunction meant it never fired. From experience facing down a loaded gun to years in some of the most high-profile coaching positions in college sports, London knows what it means to keep his cool under pressure. 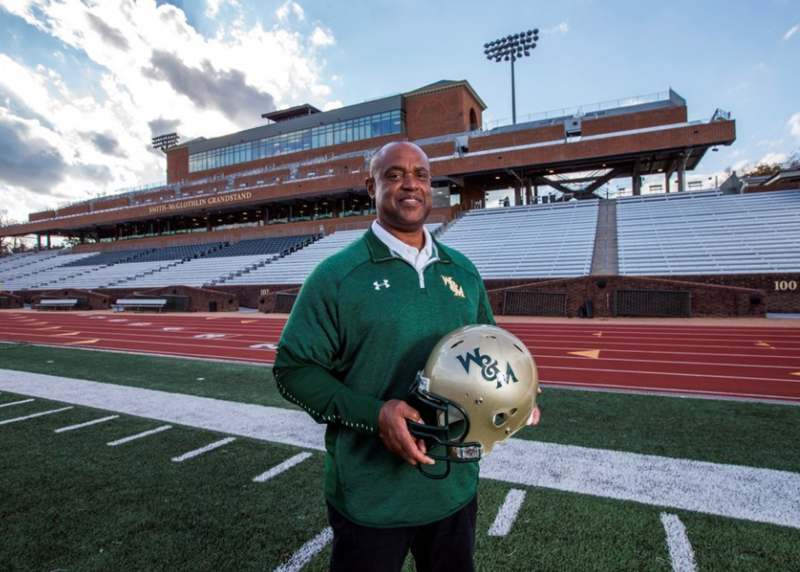 That’s part of the reason why William and Mary brought him in to fill some of the biggest shoes the College has to offer: the position of head football coach, a role that Jimmye Laycock ’70 held from 1980 all the way through 2018. The rubber pellets had barely settled on the artificial turf of Zable Stadium from Laycock’s last career game as head coach — a 10-6 loss to Richmond, highlighted by hundreds of former players returning to say farewell to their coach — when the College announced his replacement. The two-day turnaround time was possible because of the August announcement of Laycock’s retirement. With the rare gift of a full season to look for a new coach, Huge was able to start the search by first building the profile of an ideal candidate. Once the profile was established, a list of more than 20 possibilities was compiled, which was eventually whittled down to eight then four names. Finally, a shortlist of two interviewees was created. It was from talking to higher-ups in the University of Virginia athletic department that Huge started to get the idea that London was the person who would best fit this profile. Making that transition into the Williamsburg community will be natural, given that London has family members in the area and has lived in the City before. He even met his wife, Gina, at a local bank; she was working as a teller when London came in to drop off a recruiting check in one of his years as an assistant coach at the College in the 1990s. London’s coaching career spans all the way back to 1989, when he started out as an outside linebacker coach at his alma mater, Richmond. His next position was with the College, where he managed the defensive line for one of the best eras in Tribe football history; the team went 28-3 from 1992-94 and did everything from playing a bowl game in Japan to competing in the National Collegiate Athletic Association playoffs. That ability to roll with the punches, even when things went awry, sustained London’s career for the next two decades. He returned briefly to Richmond, then headed over to Boston College and Virginia before dipping into the National Football League for a year with the Houston Texans. His first head coaching gig was again at Richmond, where he assumed a role at the helm of a team stacked with potential. The lineup featured over a dozen returning starters from a squad that had, just one year prior, surged all the way to the semifinals of the Football Bowl Subdivision playoffs. But after an opening night blowout to Virginia followed by a few close losses, London’s Spiders had gotten off to an underwhelming 4-3 start. After a seven-point loss to James Madison in October, the team turned its season around. One week later, it clobbered Massachusetts to begin a win streak that spanned the rest of the season, all the way through a NCAA championship and out the other side to open the 2009 season, 8-0. By the time the streak ended, the Spiders had won 17 straight games and London had both a ring from the first ever Richmond national championship and a job offer from Virginia. London would spend the 2010-15 seasons as head coach at Virginia, where the heady success of his days in Richmond mellowed into a more modest 27-46 overall record. He followed that tenure with two years and an 11-10 record at Howard. For Huge, the focus on London’s career after Richmond isn’t on win totals. Recruiting will be a focus for London at the College, as he will try and snap a streak of three-straight losing seasons for the program. Part of the strength that London brings to the College’s recruiting pipeline is the fact that he is the first head coach of color in Tribe football history. Huge, the first female athletic director for Tribe Athletics, and Katherine Rowe, the first female president in College history, both believe that adds a crucial element to the program. On London’s part, he’s looking forward to both take over the program and return to Williamsburg two decades after he last lived there. Everything from his laundry list of coaching positions to the gun that misfired all those years ago has led him to be named the first new head coach at the College in 39 years. Flat Hat Sports Editor Brendan Doyle contributed reporting.